As the winter equinox is leaving us behind, now is the chance to try one of my favourite photography techniques: star trails. The end of summer, autumn and spring are some of the best times to do star trails (in the northern Hemisphere at least); the nights are comparatively warm, the skies less cloudy (just) and the nights just long enough to get some good trails in without having to stay up ’til stupid times in the morning. WARNING: This tutorial is LONG and detailed. Please persevere as it should guide you through everything you need to get some great star trails. For those of you that don’t know what start trails are or how you can get star trails in photography, lets go over the basics first. 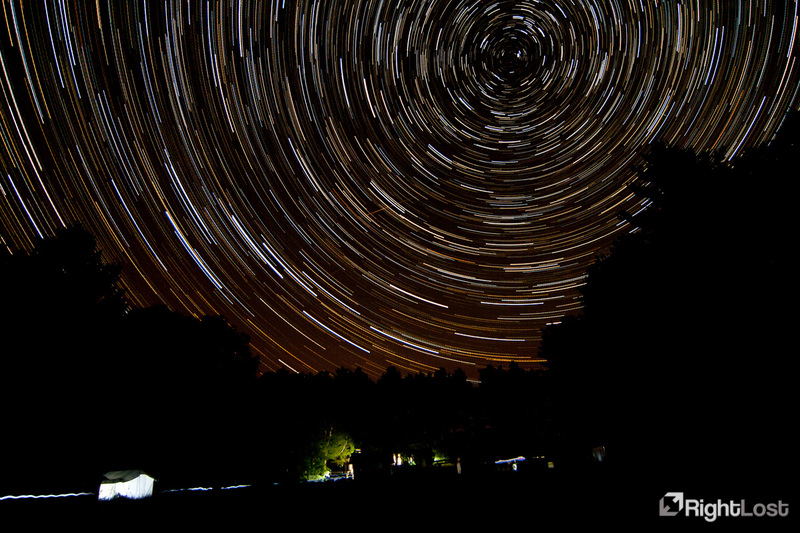 Star trails are basically long exposures of the stars, and as they move in the sky their tracks are saved in your photo. Now, the stars don’t actually move, it is the earths rotation changing the location of the stars relative to your position, the same way we get night and day and the moon and sun rise and set. Due to the rotation of the earth on its axis these trails will appear as curves, becoming steeper the closer to the North Star they are (the North Star is broadly above the axis of earth and as such doesn’t appear to move). In the Southern Hemisphere the same effect occurs around the Southern Cross. 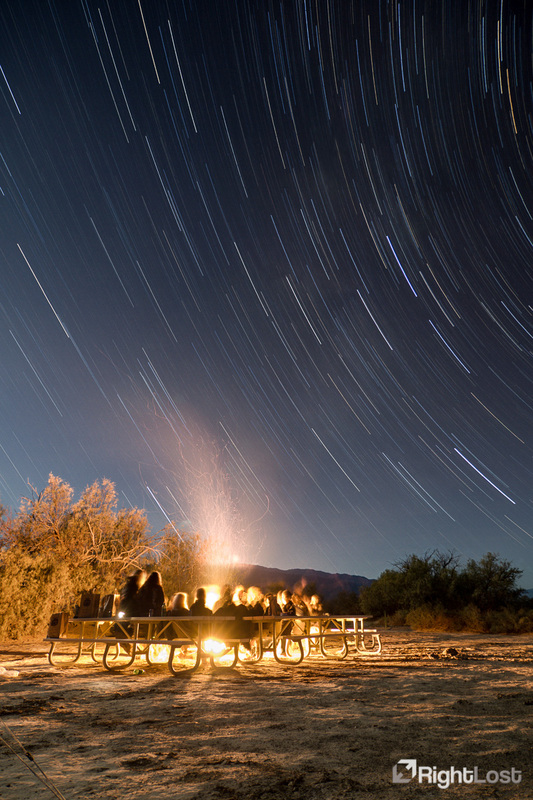 So you know you have a basic understanding of star trails and you want to try it out yourself? Well, luckily the equipment you will need is mostly pretty standard stuff. Camera with Bulb mode – Most if not all DSLR and Mirrorless cameras will have a Bulb mode. Some higher end Compacts will also have it. Wide angle lens – Any lens will do but generally you will want a lot of sky and foreground in shot so the wider the better usually, most likely your standard landscape lens (such as the 18-55mm kit lens or 17-55mm “pro” lenses for APS-C or 24-70mm on FF cameras) will work just fine, however an ultra wide angle lens would be preferable (11-16mm or 10-20mm for example). Tripod – A must really, however you could balance the camera on something if you don’t have one. Timer Remote – Some cameras will have an intervalometer built in but many don’t. I would generally recommend getting one even if yours does, it’s small, light and cheap (bought from Ebay) and saves a huge amount of hassle. This bit of kit automatically takes photos at the interval and length you want. A godsend when you want to be taking hundreds of photos one after the other. Torch – Obvious really, but I’ll put it in here. 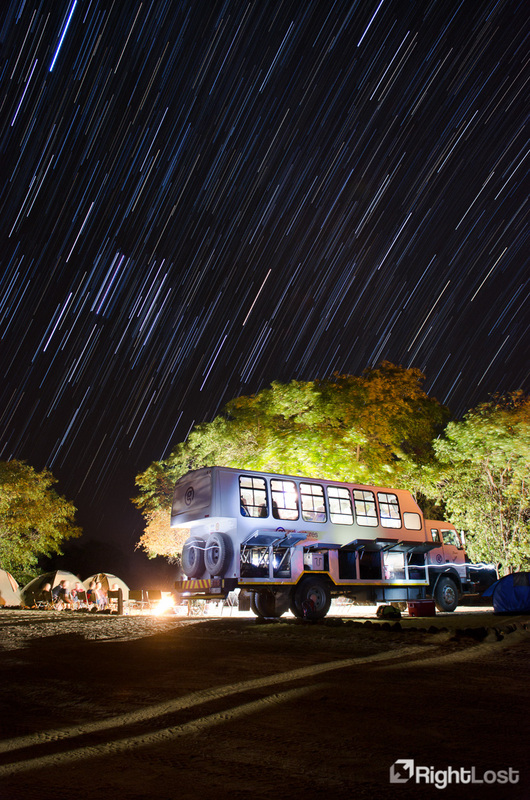 Star trails are done at night… usually in the dark… so you’ll need a torch… unless you like stumbling around in the dark with expensive gear. Full Battery – as you use a lot of power especially if it’s cold. Star map – Not essential, but it’s nice to know what you are shooting some times (and maybe more useful if you can’t identify the North star very easily). You can also use it as a time waster. There are also many great apps available on smartphones now. Both are free, easy and light (filesize) so why not? The alternative is to use Photoshop, however that takes longer and costs money if you don’t already have it. Heater – Some people find that in some conditions condensation starts to appear on the front element, to remove this risk they buy Dew Bands to go round the lens. These bands need a power source, making them quite HEAVY, but if weight isn’t an issue then 12v car jump start packs are recommended for power. I personally have never had a problem with condensation so don’t have any experience with these. I certainly wouldn’t recommend one for those travelling. One way to reduce any issues with condensation is to make sure the lens is at ambient temperature. Take a cold lens into the warm and condensation will form on the element. Right, to the nitty gritty: to get trails you need a long exposure, however this is a little more complex than it first appears. There are two techniques you can use to get the trails, the “traditional” and the “modern” way. ○ You are relying on one shot for an entire nights work, still a big task for film users as condensation, light or movement of the support could ruin it half way through and ruin an entire nights activity. ○ You also have to worry about ambient light, too long an exposure with too much ambient light (this includes the moon) could leave you with a washed out sky in a matter of minutes. Film users have this issue as well and it’s usually solved by going to a desolate place (deserts anyone?) when there is no moon, however that really cuts down how often you can practice it. Film users also have the benefit of Reciprocal failure in film, which basically means the longer the exposure of the film the less sensitive to light it is. ○ Digital users also have to worry about the sensor heating, causing noise, which can become worse the longer you expose for. You can use either long exposure noise reduction on camera (do you want to wait another three hours in the same place for it to reshoot a dark scene, let alone have the battery power?) or do it in post processing, neither of which are ideal. The “modern” way of doing star trails reduces or removes entirely the issues and pitfalls listed above, however it is only feasible for digital users. Instead of taking one long exposure this way means taking a number of shorter, consecutive exposures and then merging them. This reduces issues such as condensation, dead battery and movement as you can still use the files before the issue to create a trail, leaving the problem files out. Ambient light and noise are almost completely removed as issues as well. Now with shorter exposures your noise levels will go down (although you need to know in camera long exposure noise reduction is a BIG no-no with this technique, as explained later) and you can adjust your exposure lengths to go with your aperture and ISO, just like shooting in the day, to remove the problem of ambient light. With this technique the moon can be used as a major advantage and even street lights aren’t much of a problem! ISO and Aperture – When using the traditional method of shooting one long exposure, the ISO and Aperture will largely be dictated by the length of the exposure you want and the ambient light, however generally you will want to collect as much light as possible to get the most stars in your shot. With this in mind you need to gauge how large an aperture you can get depending on the ambient light and the exposure length. For the “modern method” you need to be thinking another way. Stars are not very bright, this means so you will generally want, as mentioned before, as much light as you can get onto your sensor (although you may want to vary it a little if you want to manage the “number” of trails in your shot) so you can get as many stars in shot as possible. To do this you want to open your aperture up as much as possible (f/2.8-f/4 is perfect) and up your ISO a little. However, when doing this, you need to remember the depth of field (DoF). Usually DoF is not a problem as you are shooting stars with a wide angle lens and you will have to focus at infinity to get them in focus. That does mean you have to be careful that any foreground is far enough away from the lens to be within the focal plane of the lens when at infinity. Usually it is not an issue as an ultra wide angle lens focussed at infinity will be in focus from a few feet away all the way to infinity. With longer focal lengths it does become an issue however. If you want to know more about this then have a play on DoF master, HERE. As an example, if you use an APS-C camera and lens at 16mm at f/2.8, when focussed at infinity (no options on the site but stick in something like 50000m for subject distance) your DoF is 4.76m to infinity, so anything from 5m to infinity will be in focus. You also need to think about the noise the ISO will create; this will be multiplied anyway due to exposure length so a compromise between sensitivity and noise levels is needed. With both those things in mind I usually shoot something along the lines of f/2.8 or f/4 at ISO200-400. With these sorts of settings you will probably end up with an exposure length of 2-5 minutes in an out of the way location with a waning or crescent moon. 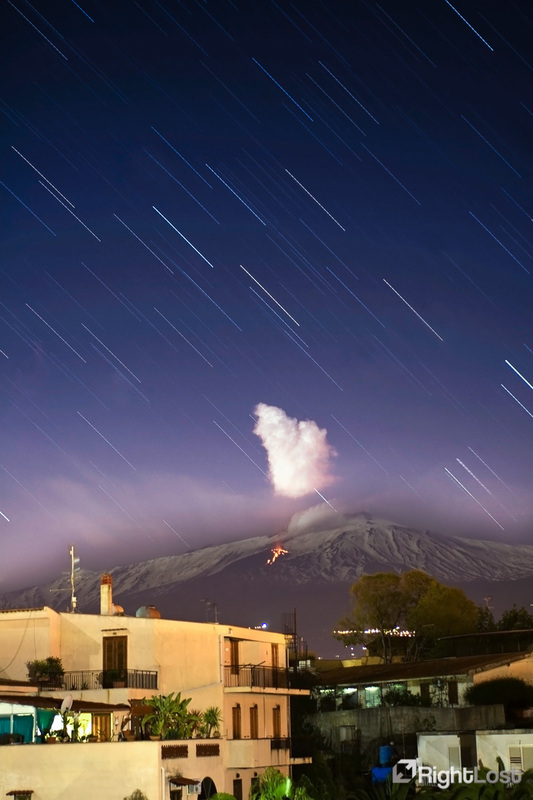 30 second exposures can be taken in a very bright location (such as a town or full moon). Your ideal exposure lengths should be around the times stated but it really depends on the conditions and how much you want to conserve space on your memory card. When deciding on settings you also want to work out whether the exposure length exposes the foreground scene AND the sky in the right way. Don’t worry about star brightness here, remember, it isn’t related to exposure length, due to the fact they move (they are affected by ISO and aperture). With the above settings in mind you should be able to go out and get some good shots, but to help I’ll go through a bit of the methodology. Most is basic photography and almost identical to shooting at any other time, but there are a couple of quirks so it may be worth reading. Location – First thing is first; where are we going to shoot? Well anywhere really, as long as you can see the sky. Using the traditional method of single exposure you will have a bit less choice as it will generally have to be in the countryside. For the modern method anywhere is game. Generally I’ll shoot in the countryside, as far away from any streetlights with as little light pollution as possible. Favourite locations include Dartmoor Tors and the coast of Devon/Cornwall in the UK. Scene – This is something you need to think about slightly differently to daytime shooting. You generally want to frame bold structures, you’re looking for shape rather than texture in a lot of cases as, unless there is lots of ambient light (such as a full moon), the actual structure will be quite dark, possibly even a silhouette. Good examples of things a lot of people shoot are large structures like Tors/mountains, standing stones and isolated buildings like churches/temples and castles. Obviously it’s not a hard and fast rule, some of the best photos are those that don’t capture the normal shots! Conversely man made light makes a great feature in otherwise dark surroundings. Whether that is a torch/flashlight (look into light painting for some real interesting options with this) or a fire. I find it brightens up images significantly AND with interval shooting you can still get great stars, even with a very bright point source directly in front. So, now you’ve arrived at the place you want to shoot and I’ll try and guide you through my method and “checklist” for shooting. Set up – Set your camera and tripod up, with your chosen lens and compose as best you can (this will be harder said than done as the image through the viewfinder may very well be pitch black and you will almost certainly not see any stars). Focus – Focussing is the next issue. Some lenses will have a focus ring and allowing you to manually focus to infinity (the ∞ symbol) with ease. Other lenses, including a large number of non “professional” lenses that make up a lot of peoples collections (including kit lenses) don’t. The trick to get a good focus with these is to try and focus on something bright at infinity, which can mean the moon if it is out or a streetlamp if you can see it, before you compose. If you can’t see a light to focus on then another way of doing it is to see whereabouts your lens focuses at infinity (not normally right at either end) before you head out and then adjusting it when at the shoot site (for example the 18-55 kit lens that came with the Canon 400D would need a 3mm twist from one end to get optimum focus), or you can just do it with trial and error, checking focus using the next technique. Live View can help here, however it depends how dark the location is. You may just get a black image. Another benefit of live view is the integrated level many cameras have now to ensure you horizon is straight. So that means if your 30s exposure (at ISO1600 and f/2.8) came out perfectly exposed then you don’t really want to have any single exposure for more than 8 minutes at a time or you might overexpose your shot. More detail here. Expose – So everything is sorted, you’ve composed and focused properly, worked out the exposure lengths and then checked, checked and CHECKED AGAIN. Now you’re ready to shoot (If you are using the traditional method then ignore the rest of this bullet point as well as the next). This is where I get out my Timer Remote and program the exposure length and number of exposures, attach and start it then sit back and relax (or shiver). If you don’t have one you will have to concentrate a bit more. Most cameras won’t let you expose in bulb mode without even a basic remote so you will need at least one of these. Open the shutter using the remote and then wait until the exposure length is reached (either using the on screen counter if your camera has one or a stopwatch (most phones have them)) and then close the shutter, then open it immediately again (you want the minimum time between exposures as these will leave holes in the trails), rinse and repeat until you have the time you want, you get bored or the battery runs out… Occasionally, when doing it manually I may flash my torch over the front element between exposures just to check for condensation. At the end of the night you may also want to stick the lens cap over the lens and expose a few more “dark frames” which will be used later to help remove noise (REMEMBER, don’t turn on Long Exposure Noise Reduction). Dark frames need exactly the same settings as the standard shots you have just taken so if you have exposed at f/4 and ISO200 for 2 minutes you need to expose at that ISO for 2 minutes again (with the lens cap on) to get correct dark frames, the more Dark frames the merrier. Build – Well that’s the end of the field work! However if you have done multiple exposures you haven’t finished yet. Now is the time to stack them together. Here you have three main options, either Photoshop, the easier Starstax, or the simplest option (and the way I usually do it) using the startrails.de software mentioned at the start. ○ Firstly download the software, extract and run it, no need to install, it will run straight out of that folder. ○ Use the open button, navigate to the photos you want to merge and select all of them before pressing ok.
○ Add any dark frames you may have taken using the open button with the black square. ○ Deselect any images you don’t want stacked and press the startrails button. And you’re done. You should have an image almost exactly like you would have done if you did one long “traditional” exposure. You can now go on and process the result if you want (Hint: if you shoot RAW do all the RAW processing first on one photo then save the edited settings and apply them to the rest of the images, that means you won’t make one or more images look odd when stacked). Even if you don’t like editing images, whether you have used the traditional or modern method you may want to open the image in a photo editing program and remove any aeroplane trails, these will consist of a straight line with dots either side, unlike the stars that will be in a broad ark. Make sure you don’t mistake any meteor captures however. If you’re lucky enough to capture one they look like very dim straight lines through the picture. 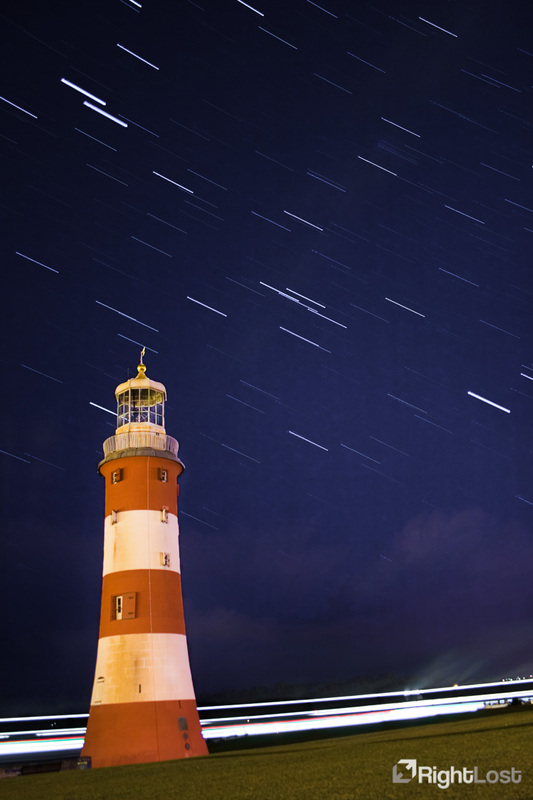 Stack resulting images to get the star trail you want! So, now you (hopefully) have a brilliant star trail photo and, like me, probably realised that you could do better next time… And then the addiction starts! If you used the modern method then there is one more thing you can do, using the startrails.de software you can also create a Video, unfortunately the program can only make small ones but they can be quite interesting so it’s worth a try! Go through the first 3 steps shown above, but instead of pressing the “Startrails” button, press the button to the right (with the video camera on) and choose the size (I’d leave as is) and framerate (probably around 2-5fps) and save. Hopefully this tutorial should not only help those that are looking to shoot star trails but also inspire some of you to try something different! Below is a list of links to websites and software discussed in this article. I have also included a couple of other links that may be very useful.